In addition to Lakeport’s regular weekday tours, Lakeport will add Saturday hours (11 a.m. – 3 p.m.) from May 28 until July 30. Mon-Friday Tours at 10 a.m. & 2 p.m.
Open Saturdays to visitors 11 a.m. – 3 p.m.
Lakeport Plantation is open year round; summer hours add extra Saturday tours to our regular Monday through Friday schedule. Office Hours: Monday-Friday: 8:00 a.m. – 5:00 p.m. If you’d like to tour Lakeport at another time other than 10 a.m. or 2 p.m., please call us 870.265.6031. Lakeport Plantation’s monthly history talk, Lakeport Legacies, will feature Dr. Rebecca Howard on May 26. Dr. Howard teaches at the University of Arkansas, Fayetteville, sits is on the Tontitown Historical Museum Board, and is a descendant of the first Italians immigrants that came to Chicot County’s Sunnyside Plantation in the 1890s. Her talk titled, “The Adventures of the Bastianelli and Pianalto Sisters: History from the Tontitown Museum” will examine the lives of five sisters who were part of the first wave of Italian immigrants to Sunnyside. Later the sisters immigrated again to Tontitown in northwest Arkansas with Father Pietro Bandini. Many in the generation who immigrated as children followed Old World marriage habits, delaying marriage until they were financially established. Few walked down the aisle before their late twenties or thirties. 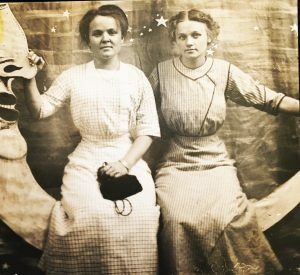 So what did a young woman in the 1910s in rural Arkansas do with an extra decade or so as a single woman? Between the five Bastianelli and Pianalto sisters, they lived in at least four states, taught school, became nurses, and aided priests. One sister was a long-time schoolteacher in Lake Village. Another was among the first graduates of St. Edward Nursing School in Fort Smith. Two exercised their voting rights for the first time in California. An examination of their lives reveals fascinating information about an often “silent” generation. The Sunnyside Plantation, situated just north of Lakeport, was the largest cotton plantation in antebellum Arkansas. Austin Corbin, a New York financier, acquired the plantation around 1886. Corbin experimented with convict labor and began modernizing the plantation with a short line railroad, telephone, and a steamboat anchored in Lake Chicot. In 1894 he subdivided the plantation into 250 twelve-and-half-acre plots with houses. In November and December 1895, 138 Italian families arrived with Sunnyside contracts in hand. The contracts offered the immigrants a house and land for $2,000, payable over 21 years at 5 percent interest. By 1910 there were 739 Italian born individuals living in Chicot County. However, contract disputes, disease, and other issues at Sunnyside forced some immigrants to leave. Father Pietro Bandini, assigned as chaplain to the new immigrants in early 1896, led a sizable group of Italians in 1898 to the Tontitown settlement in northwest Arkansas. The story of the Italians at Tontitown is told and preserved at the Tontitown Historical Museum. Founded in August 1986, the museum is housed in the home of two of its original settlers, Mary and Zelinda Bastianelli. For more information and to RSVP, contact Blake Wintory 870.265.6031. Lakeport Legacies is a monthly history talk held on one of the last Thursdays at the Lakeport Plantation during the spring and summer. Each month a topic from the Delta region is featured. The event is free and open to the public. The Lakeport Plantation is an Arkansas State University Heritage Site. Constructed ca. 1859, Lakeport is one of Arkansas’s premier historic structures and still retains many of its original finishes and architectural details. Open to the public since 2007, Lakeport researches and interprets the people and cultures that shaped plantation life in the Mississippi River Delta, focusing on the Antebellum, Civil War, and Reconstruction periods. Arkansas Heritage Sites at Arkansas State University develops and operates historic properties of regional and national significance in the Arkansas Delta. ASU’s Heritage Sites include the Hemingway-Pfeiffer Museum and Educational Center, Southern Tenant Farmers Museum, Lakeport Plantation, the Historic Dyess Colony: Boyhood Home of Johnny Cash, and the Arkansas State University Museum. The Bastianelli & Pianalto sisters were part of the first wave of Italian immigrants that came to the Sunnyside Plantation in Chicot County in the 1890s. Later they immigrated again to Tontitown in northwest Arkansas with Father Pietro Bandini. Many in the generation who immigrated as children followed Old World marriage habits, meaning young couples delayed marriage until they were financially established. Few walked down the aisle before their late twenties or thirties. So what did a young woman in the 1910s in rural Arkansas do with an extra decade or so as a single woman? Between the five Bastianelli and Pianalto sisters, they lived in at least four states, taught school, became nurses, and aided priests. One sister was a long-time schoolteacher in Lake Village. Another was among the first graduates of St. Edward Nursing School in Fort Smith. Two exercised their voting rights for the first time in California. An examination of their lives reveals fascinating information about an often “silent” generation.